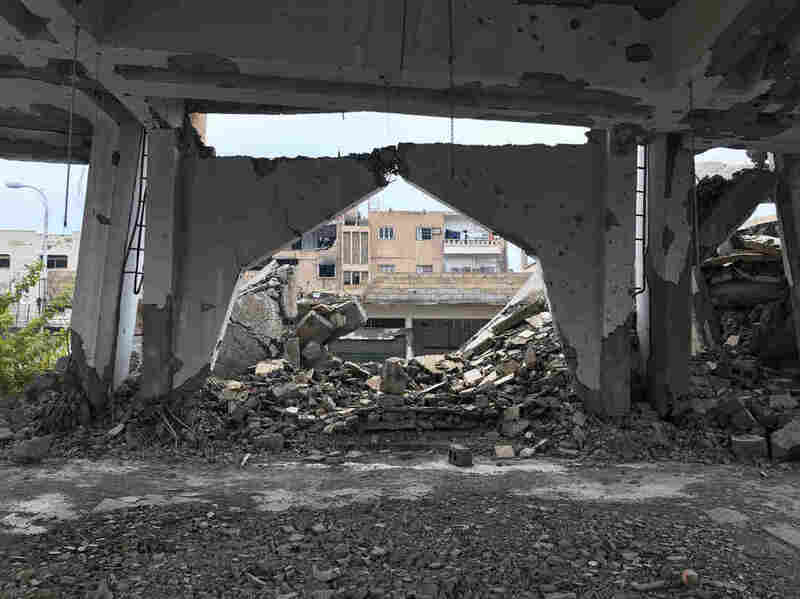 Determined To Seek An Education, Teenagers In Raqqa, Syria, Create Their Own School With their city in ruins and little international help, a group of teenagers decided to take matters into their own hands. They recruited teachers, found a building and set up classes for themselves. A church near the school was destroyed during the fight to oust ISIS from Raqqa, Syria. In a classroom that's so cold you can see your own breath, five teenage girls, their hair covered by brightly patterned scarves, and two boys read English phrases from textbooks. Repeating after their teacher, they say, "It has plants from all over the world." The lesson, about an indoor rainforest in the United Kingdom, is a world away from the devastation surrounding them. They are students in Raqqa, Syria, a city that ISIS once claimed as its capital. Beside their school building lie the remains of an Armenian church, and beyond that, a wasteland of apartment blocks crumpled by airstrikes. The city's public park, once lush and green, has become a mass grave. Learning is exactly what these students want — so much so that the school is of their own making. "We started looking for teachers at the beginning of July this year," says 18-year-old Diana, who, like most Raqqa residents, says it is unsafe to be quoted by full name. President Trump's decision to withdraw U.S. troops from Syria, they say, makes their situation even more precarious. After ISIS was forced out of Raqqa in October 2017, in large part by a massive U.S. aerial bombardment that also wreaked destruction on the city, the Trump administration promised to rebuild key infrastructure, including schools and hospitals. But more than a year on, for the most part, this hasn't happened. The city's public park, once lush and green, is now a mass gravesite. While some primary schools have reopened, there is almost nowhere for older children to learn. So, with their city in ruins, and seeing little international help, Diana and her friends decided to take control. "First of all," she says, "we found some teachers. And then we found the location of the institute and we started studying." She makes it sound simple, but finding adults to teach them wasn't so easy. Most of the city's teachers had either fled or been killed. So the teenagers had to expand their search beyond the city itself. "Yes, I was surprised," says Ali, the school's English teacher, remembering the day this group of kids showed up at the door of his home in a village east of Raqqa, asking him to help them learn. They'd heard about Ali by word of mouth. He had been a teacher in Raqqa since 2005. Moved by their request, he helped them reach out to other teachers and to find a space they could use for a classroom. Now this private institute has 10 teachers and a few dozen students. Ali comes to work even though he barely has a house to return to; its walls were partially blown out in the war. 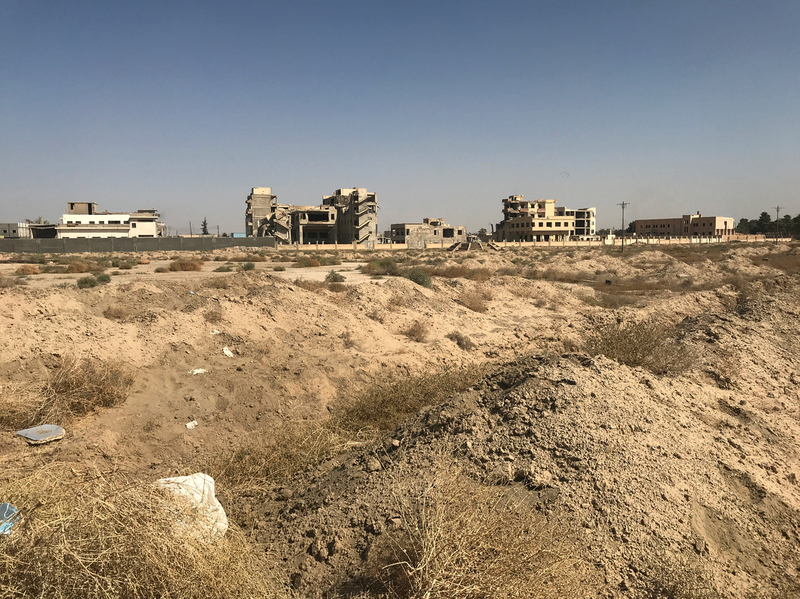 After years of violence and loss, few in Raqqa have much money anymore, but the students and their families scrape together what they can for the teachers' salaries. There's little electricity and, on the day NPR visited the school, the only source of heat against the bitter winter temperatures was some charcoal set in a metal tin on the floor in one room of the building. The lessons in most subjects are basic. The students say they missed out on four years of education — and in some cases, five — during ISIS rule and the subsequent war to oust it. "We suffered a lot during this time," says 19-year-old Batul. "We were displaced from our homes and cut off from learning. Children younger than us are completely illiterate. Those older than us had their high school years cut, and so lost their chance of a future; they are just sitting at home without any work now. It's a terrible life." But for Batul and the other students, it's not too late, and they hope getting an education will help turn their lives around. She wants to become a doctor. Abeer, who sits beside her in class, wants to be a pharmacist. Diana is studying to be an engineer. Bilal, 19, one of the two boys in the class, wants to be an architect. Ali and his students are nervous to talk about sensitive subjects such as politics. They fear being targeted for arrest or worse should they say something that might anger one of the many factions in their country's long war. But slowly, and then more passionately, they admit they fear the consequences of President Trump's sudden decision to withdraw U.S. troops from Syria. Raqqa is run by a civil council including a mix of local residents and Kurds whose militia fought to take the city back from ISIS. They work under U.S. backing, liaising with U.S. troops and State Department officials about the needs of the city. If the U.S. leaves, Diana says she fears it will create a power vacuum that may allow ISIS to return: "Honestly, if ISIS comes back, we will have destruction again and fear will spread," she says. "And they will butcher people — so many souls will be taken." Even if ISIS doesn't gain a foothold in Raqqa again, there are many other risks. The Syrian regime may want to take back control of this city, and the students also worry about an offensive by Turkey, which has been threatening military action and sees the Kurds who hold this area as being aligned with terrorists. "In all of this, our biggest fear is to be displaced again," says Abeer. "We had to leave our homes, and to have to do that again? That would be a catastrophe!" A U.S. withdrawal from Syria is also expected to affect aid efforts. American aid workers have already been asked to leave, and while U.S. officials say there is still money for assistance in the coming months, they acknowledge they don't know what will happen in the longer term. Raqqa's emergency services are essential for the city. They recover corpses from under the rubble left by the counter-ISIS offensive and help rescue the living. These services are funded by American and Saudi money, but rescue workers tell NPR they've been informed their salaries are being slashed. They will earn $150 per month, down from $600, they say. They don't know how long they will remain employed. All this weighs heavily on the teenage students and their teachers. Speaking in a defeated whisper, Ali says he hopes the decision to withdraw U.S. troops can be "delayed." Syrians don't want American troops on their land forever. But for now, he says, "Raqqa needs more help."